Today is our final day of discussion for QUIET by Susan Cain. Thank you all so much for joining in the conversation, even despite the delay in some of the questions. Be sure to check back next month for our next selection for our year of readalongs! Now, the final question . . .
How would you rate this book on a scale of 1 to 5 (1 being the lowest, 5 the highest)? Would you recommend it to others? What would be your elevator pitch for the book? Two days, two more questions! What did you learn from reading QUIET? Did certain parts of the book intrigue you more than others? The month has flown by, and we only have three days left. That means three questions left. Let's get to today's! What are the advantages of being an introvert? What are the advantages of an extrovert? What about the disadvantages to both? I'm so sorry for being away again. My family has recently experienced another death of a loved one that is near and dear to our hearts. I have not had the chance to do much reading and I got a bit behind in the reading. But, I'm back and I'm hoping to post new questions throughout the rest of the week/month, and wrap up this conversation. Let's do it! The author shared her own example of using the power of introversion to work through a negotiation. Though many of those in this field tend to be extroverted, she discovered that she too had much to contribute. Have you ever seen your own personal power of introversion win, whether it be at home or at work? Share your own example, and what you learned from the experience. I'm back and ready to really get to chatting with you about QUIET by Susan Cain! I'm done organizing the big event that has swallowed up my life the last couple of months, and I'm ready to get back into the books, especially this one! We have previously talked about if we are introverted or extroverted, as well as those around us. Now, let's take a look at a bit larger circle in our lives. Do you remember any introverted role models that have been in your life? What about them do you remember or inspired you? Welcome back to our conversation about QUIET by Susan Cain. I apologize for being away for so long, but I promise to get better at posting regular questions this month. I am currently in the midst of planning a big event for this weekend, so you will see more questions coming the second half of the month. In the meantime, I have another question for you! Let's look at those around for a moment ... spouse, children, siblings, parents, etc. Do you find that you are surrounded by fellow introverts or extroverts or a mix of the two? How about your friends? 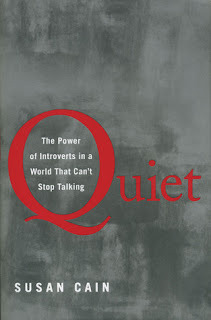 Welcome back to our conversation about QUIET: THE POWER OF INTROVERTS IN A WORLD THAT CAN'T STOP TALKING by Susan Cain. I'm keeping it short and sweet today with an easy question that will help in understanding where we are for the rest of the conversation. In the INTRODUCTION, an informal assessment to determine if you are introverted or extroverted is found on pages 13-14. Using that assessment, how did you score? Are you introverted or are you extroverted or is your score pretty even? Before doing the assessment, how would you have categorized yourself? and a new readalong here at Book Bloggers International! 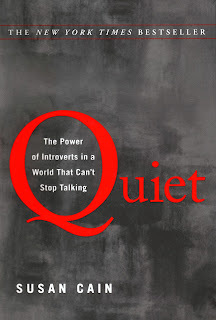 I am very excited to announce that this month we will be reading QUIET: THE POWER OF INTROVERTS IN A WORLD THAT CAN'T STOP TALKING by Susan Cain. During our previous readalongs this year, we have done weekly or monthly discussions. This month is going to look a little different because only one question will be posted at a time, and questions will be shared multiple times a week. I'm hoping it will help to generate more conversation and dialogue on the topic throughout the month. You can expect questions anywhere from 2-4 times per week, depending on content. I have listed a general reading schedule below for those who prefer the scheduled reading, but please keep in mind that questions will be thrown out throughout the week and you may or may not have had to read the chapters to answer the questions. Let's start with our first question of the month for QUIET. It's an easy one. Have you already read QUIET or do you intend to read along with us this month?